Celebrate your soon-to-be married status with this seal and send wedding invitation featuring "Soon to be Mr. & Mrs," "Join us," and "True Love" in charming script. All wording prints in the same ink color. This style of seal and send includes your response wording and reception wording. You may choose to purchase a plain white response card with envelope instead of, or in addition to, the response wording on your invitation. Your return address is printed on the coordinating seals included with the seal and send. The seal is placed on the front to secure the invitation closed; the guest's address is written on the back. This invitation is printed on 94 lb, bright white paper and features flat printing. 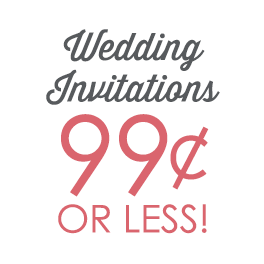 Please note that additional postage is required for mailing square wedding invitations. Please Note: Your return address is printed on the coordinating seals included with the seal and send™. The seal is placed on the front to secure the invitation closed; the guest's address is written on the back. 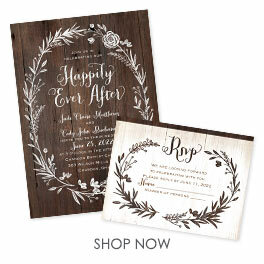 Please note that additional postage is required for mailing square wedding invitations.